I’ve got to thinking that the worst possible arrival point in a major city is the train station. They’re often dismal places with dark unpleasant corners where rubbish collects and people loiter. Ironically, the opposite is true in Istanbul where the Sirkeci station, located just below the Topkapi palace and beside the Golden Horn, is a bit of a stunner. Sod’s law that we arrived by bus! The main bus station is enormous, twenty football pitches enormous according to Jim who knows about football. Dozens of different bus companies have their offices around the perimeter of a huge central square of concrete. On one side a building houses a market with cafe tables facing out where you can watch the buses arrive or wait for them to depart and see the stream of yellow taxis come and go picking up fares. I know, we’re really living the dream! 5 am and dopey from the journey, our priority was some coffee and maybe a tiny bit of breakfast – much too early really, but night travelling makes me hungry. We picked the cafe where we found the most charming smile – all cafe owners here smile to try and win your business so you have to become very discerning about smiles. Great smile, absolutely dreadful coffee. If you don’t want Turkish, the default option is nescafe but unbelievably strong, like drinking dilute shoe polish (dark tan). Jim had cheese toast and I had a simici, Turkey’s answer to the croissant. They have things to learn from the French. We’re travelling light, so no maps or tourist guides in the backpack. Hitherto when we’ve arrived in a city we’ve managed to pick up a map of some kind and find our way on foot to our hostel or hotel. At Istanbul’s central station you can buy food, clothes, electrical equipment, shoes, bicycles and batteries; you have the choice of 11 cash machines all huddled together in a sort of ATM convention; but no Tourist Information. No, you can’t get any information about the city and nobody sells maps! After about an hour of prowling around waiting for… I don’t know what, inspiration maybe, we broke with the Woodman tradition of eschewing easy options and climbed into a taxi. As we drove the several miles into the centre of the city and were dropped at the edge of Taksim Square, we quietly conceded that we’d been a bit naive to arrive in a city like this one – 14 million inhabitants speaking a language we don’t understand – so unprepared! It’s still only 6 am and we have several hours to wait before we can get into the self-catering studio we’ve booked for 3 nights. Another coffee, obviously, and more charming young men to supply it, this one infinitely worse than the last and much more expensive. Coffee is an important part of life for us – the taste, the effect, the ritual; this could be a crisis. We loitered and wandered and 5 hours passed and we could get installed in the Adonis apartments. We have a little 3rd floor studio room, no lift, but Adonis himself carried both our rucksacks upstairs – an Adonis with the Hercules gene perhaps? Actually, a rather softly spoken, shy and diffident chap called Ahmed but Adonis makes for better copy! 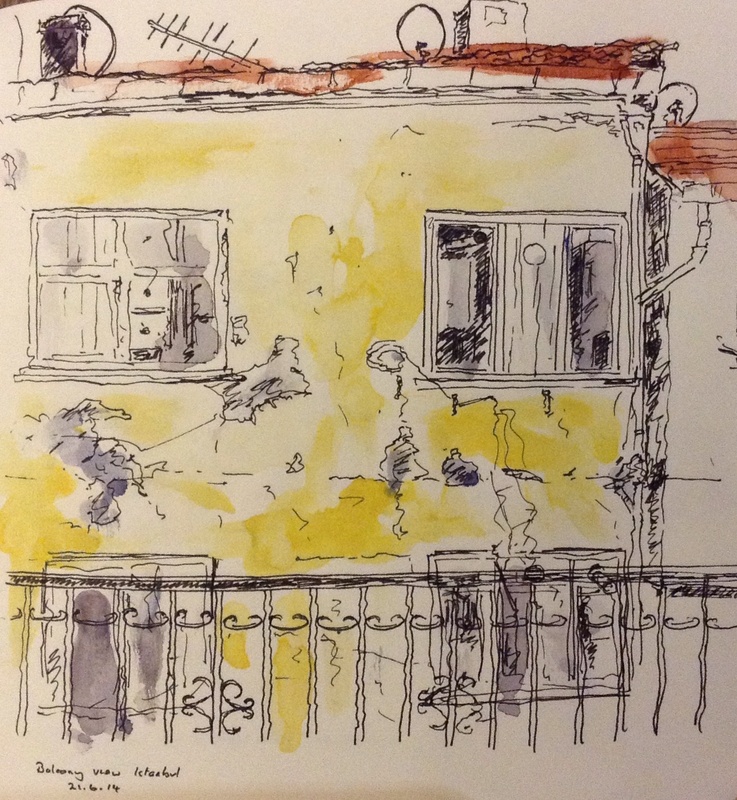 So, one room, big bed, wall-mounted TV with about 700 channels, tiny but perfect little balcony (Jim’s sketch below) with views over the higgledy-piggledy apartments and tenements of Taksim and the next hill to the west, and looking across the back yards to where other people’s laundry hangs out to dry. We have 2 rings on a little hob, and exactly 2 of everything – forks, knives, spoons, plates, bowls, cups…. Hmmm perhaps Noah was here! Everything seems to work although the water supply is erratic and the hot water has two settings, warm and scalding, alternating randomly between them. Fortunately the shower cubicle is big so you can make a dash for the side when the seriously hot kicks in. Jim cooked a terrific supper with pasta, garlic and olive oil carried in his rucksack all the way from Lake Bled and tomatoes from the stall round the corner. We supped on the balcony as the sun went down. Great little refuge where we can relax at the end of the longest day of the year. Your best post yet, Lizzie! You’ve got that travel writer job for sure this time!